We recently partook, with the assistance of a research participant, a scientific eye test to prove the level of degrees that Chin Up Goggles occlude the lower portion of your vision. The eye test which was carried out is the standard Irish National Eyesight test and the results, which are in degrees, can be transferred to each individual accurately. The Chin Up Goggles Occlusion Scientific Eyesight Test comprises of the participants head being in a fixed position, staring into a vision testing device. The participant must keep his eyes fixed on a small orange light in the middle of the device. Over the period of four minutes to four minutes forty seconds a small white light will flash 120 times at different areas in the device at different intervals. The participant must press a buzzer each time he sees the white light flashing. The tester firstly carried out the eye test on the research participant without wearing the Chin Up Goggles. The participant saw each of the 120 lights flash. The tester then carried out the eye test on the participant while they were wearing the Chin Up Goggles. The participant saw 107 of the 120 lights flash, unable to see any of the lower level lights when they flashed. Before we speak about the above results please note the following symbols on each test. ▪ This symbol indicates each light not seen flashing. ─ Each of these symbols on the vertical and horizontal lines represents 10 degrees of vision. Left and Right on the horizontal line test as far as 80⁰. On the vertical line the upper portion test as far as 30⁰ and as far as 55⁰ on the lower portion. On the first test where the research participant was not wearing Chin Up Goggles he was able to see all lights flash, covering 80⁰ right and left, 30⁰ upper and 55⁰ lower. On the second test where the research participant was wearing Chin Up Goggles he was able to see all lights flashing on the straight horizontal line, covering the 80⁰ right and left and he was able to see all 30⁰ of the upper portion. 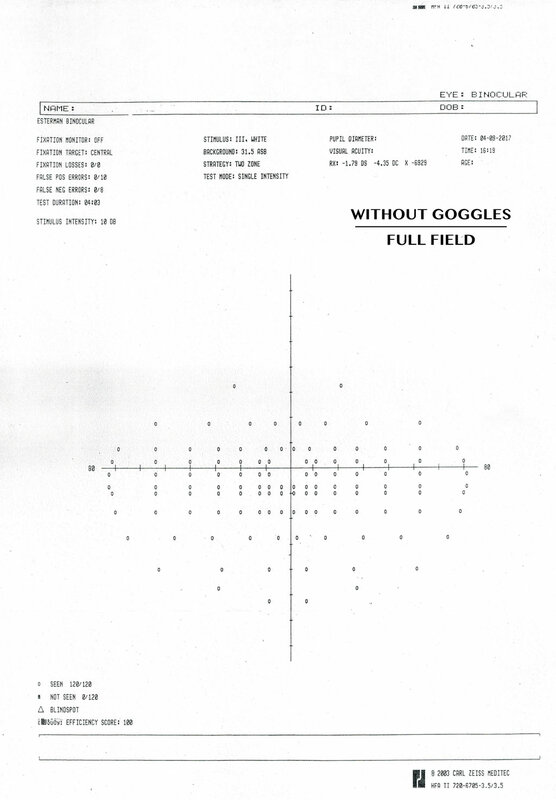 However, on the lower vertical line the participant was unable to see anything below 30⁰ as the Chin Up Goggles were occluding the lower portion of his vision. 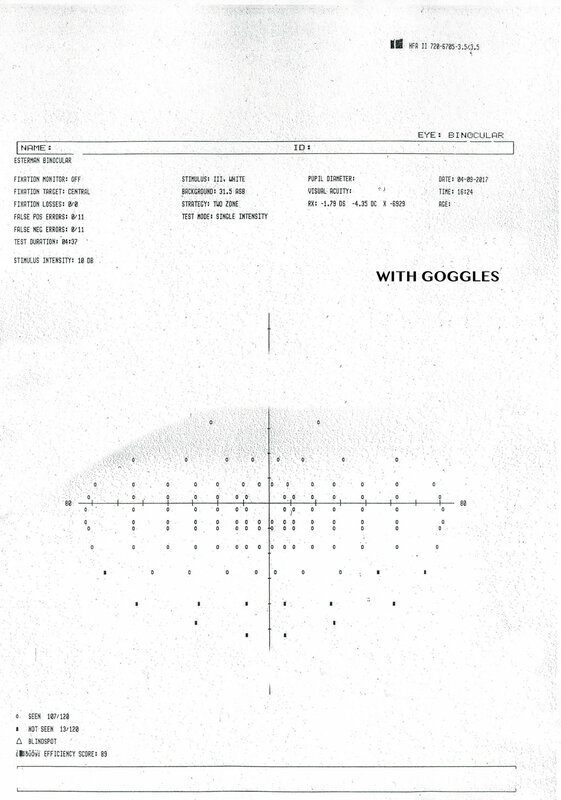 This eye test scientifically proves that by wearing Chin Up Goggles you are excluding 30⁰ of your lower vision. When transferred to sporting activity, when you wear Chin Up Goggles as a sport training aid you are unable to see any item under 30⁰ of your lower vision. Therefore you can train to control a ball while still looking outward.